In light of our Holy Father's often repeated call to read the Gospels daily, including gifting thousands of people at a recent Sunday Regina Caeli prayer in St. Peter's Square with copies of the Gospels, the USCCB will be publishing a similar product for those of us in the USA. 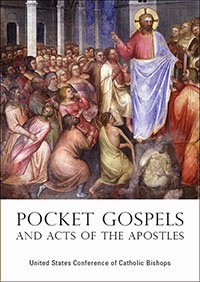 This small pocket-sized book has the four Gospels and the Acts of the Apostles with a beautiful Italian fresco on the cover just like the Pope's! Take it with you and read it anytime you have a few minutes during the day. On the bus! Waiting for an appointment! Anytime! I was wondering when they were going to crank this out. Thanks for sharing, Tim! I know that this is probably a shot in the dark, but is there any mention of what the font size is? Six by four seems pretty decently sized, but small fonts are a no go at my age. The answer is 10 pt for the scripture and 5.5 for the textual notes. Thank you, Timothy! That's good to know.